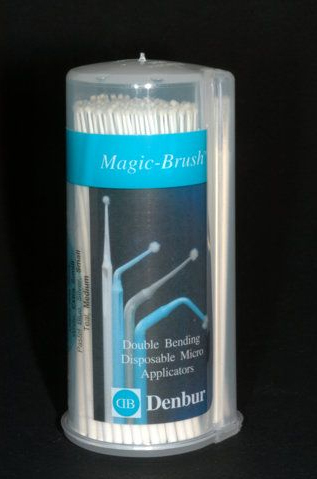 Magic-Brush is an exclusive double bending disposable micro applicator. There are two indentations on the applicator: one on the handle, and the other on the neck. The indentations allow the applicator to bend easily in two separate areas independently or simultaneously. The double bending feature is useful for applications from the lingual, for example. There are two “pillars” surrounding the indentations which work as a “locking notches” when the applicator is bent to help maintain the bending position constant. Two indentations allow the applicator to bend easily. The “pillars” surrounding the indentation work as a “locking notch” when the applicator is bent, even as pressure is applied.